We here at South Shore Conservatory can't imagine our life without the arts. Can you? To learn more about SSC programs and events, visit sscmusic.org or find us on Facebook. 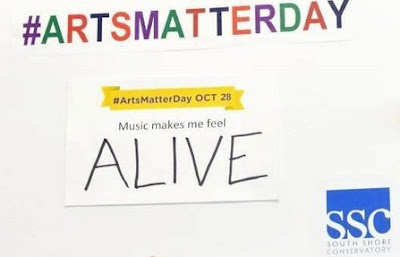 "For the third consecutive year, South Shore Conservatory (SSC) participated in MASSCreative’s Arts Matter Day to publicly express why the arts matter to us." inform Elaine Sorrentino, South Shore Conservatory’s Communications Director. Created as a vehicle for showing our legislators the importance of the arts to all populations, Arts Matter Day allowed us to crow about how the arts make a difference in our personal lives. SSC was one of 640 participating arts and cultural organizations and individuals. Among the other organizations who joined us in posting photos and videos on social media were the Museum of Fine Arts, Longy School of Music, Artists for Humanity, Arts Boston and BosTix, Oliver Ames High School, the Clark Institute of Art, BU Arts Initiative, Boston Lyric Opera, Institute of Contemporary ARtBoston, and a host of others. Parents, students, faculty and staff members took pen to paper, taking stock of their many reasons for needing the arts in their lives. SSC moms were perhaps the most passionate about their love for the arts. They see the difference the arts make to their children every day. Music Together moms wrote that the arts matter to them because they shape their children’s lives, and instill a sense of wonder in their children. 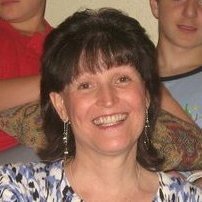 Preschool mom Lara Thompson said “the joy of singing and learning to play music last a lifetime.” An active member of SSC’s Woman Song ensemble, Lara would know! Other young moms chose less wordy responses to the question of how music makes them feel. “ALIVE!” and “like dancing” and “like breathing!” were all testaments to the power of the arts in helping us learn, express and be human. At the Hingham Senior Center, our adult ukulele students proved that the benefits of the arts doesn’t stop at childhood. As they posed for a picture, proudly displaying their ukuleles, these seniors shared that the arts matter to them because they give them great joy. And this statement gave their instructor John McCarthy great joy!